Just a brief reminder: The Apache Hadoop Get Together Berlin is supposed to take place today in newthinking store, Tucholskystr. 48 at 5p.m. 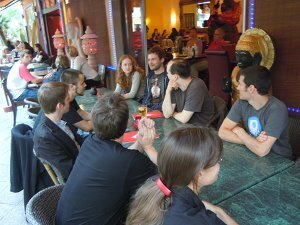 The meeting features two talks on Apache Mahout: Committer Sebastian Schelter will explain how to scale recommender systems with Mahout. 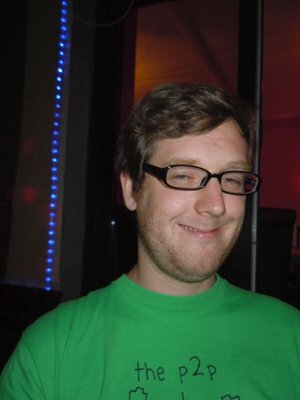 Contributor Max Heimel is going to give an introduction to the sequence labeling facilities available in Mahout. As usual the group will move over to Cafe Aufsturz after the meetup is over. A big Thanks goes to JTeam for sponsoring video taping as well as to newthinking store for providing the venue for free. The Apache Dinner Berlin will take place today. As always, everybody is invited even if you didn't participate in the poll (http://doodle.com/8bi2456enwe6z2g6). This time around the dinner was organised by Daniel Naber. Thanks! Where: Lindencafe, Rudolf-Breitscheid-Str. 47/48, 14482 Potsdam-Babelsberg, This is directly next to the S-Bahn (S7, Babelsberg). Looking forward to see you there at 7p.m. 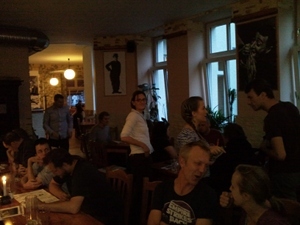 This evening yet another Apache Dinner took place in Berlin (this time Schöneberg), location booked by Simon Willnauer. As it was announced less then a week ago (see post below) we were expecting no more then some 7 people ... we ended up being a group of 15 attendees: There was Michi Busch from Twitter together with Tanja, Uwe Schindler from Bremen joined us. With Matt and Josh some of our local Hadoop users from Nokia joined our group. We had Sebastian Schelter from Mahout. In addition there were the usual suspects, that is Jan Lehnardt, Simon Willnauer and Torsten Curdt. Indian food at Yogi Haus was great and very tasty - though we should introduce a sharing algorithm for the various dishes next time around. Speaking of next time: If you would like to be part of the dinner, subscribe to our Apache Dinner mailing list. Best way to make the location suit your needs is to simply send out the next proposal yourself. Update: Images added. Thanks for forwarding them. Simon (Willnauer) just sent around the following e-mail. If you have some time left next Monday evening, come join us in Yogihaus: For tasty Indian food, geeky discussions and a generally beautiful evening. Unlike the other dinner mails this one is not a poll, it's an announcement. 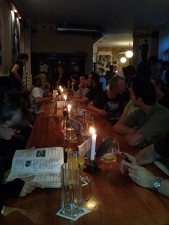 Some Apache folks are in town next monday (9th of August) so we decided to have a Apache Dinner with a short term notice. If you plan to come please shoot me a quick heads-up and I count you in! Looking forward to meet you there on Monday!! Looking forward to seeing you on Monday evening next week. Please do not forget to give Simon a quick heads-up if you are coming: Would be nice if our estimated number of guests would at least be close to the real number this time (instead of somewhere at 50% ;) ). In the unlikely event that you can't make it next Monday, please subscribe to our Apache Dinner Mailinglist to recieve further announcements. If you are not living in Berlin but are still interested in dropping in from time to time: Don't worry we do take into account that schedules of people travelling here are tight and organise meetings accordingly. Every three months I am organising the Apache Hadoop Get Together in Berlin. I have been asked (and accepted the offer) to publish articles on Hadoop and Lucene in magazines. There are various conferences I attend - either as speaker or simply as participant: FOSDEM, Froscon, Apache Con NA, Devoxx, Chemnitzer Linuxtag - to name just a few. For Berlin Buzzwords I did get quite a bit of time for organisation, still some issues leaked over to what others would call free time. I am mentoring one of Mahout's GSoC students which is a lot of fun. At least I try to spend as much time as possible on the Mahout mailing lists keeping up with what is developed and discussed there. There are various techniques to cope with increased work load and still find enough time to relax. Some of them involve simply remembering what to do at the right time, some involve prioritization, others deal with measuring and planning what to do. In this tiny series I'll explain the techniques I employ - or at least try to - in the hope of getting your feedback, and comments on how to improve the system. After all, the most important task is to constantly improve ones own processes. My xmpp is: fdmanana@gmail.com. Feel free to add me. So, if you are interested in Apache head over to Filipe - I'd love to be there, however my summer vacation ended one week ago. Wish you guys a lot of fun.